​Thyroid cancer responds well to treatment when detected early. The Department of Surgical Oncology at National Cancer Centre Singapore explains how the da Vinci System helps treat thyroid cancer. ​minimises the visible scarring commonly associated with traditional thyroid cancer surgery. More common among women than men, thyroid cancer is among the top 10 cancers affecting women in Singapore. This cancer affects the butterfly-shaped thyroid gland which is located at the base of the neck; the thyroid gland produces hormones that regulate everything from your heart rate to how quickly you burn calories. Thyroid cancer, whose symptoms can include a lump in the neck, pain that extends to the ear and trouble swallowing, has been found to be more common in areas where iodine consumption is very low. Thyroid cancer is usually diagnosed between the ages of 30 and 50, and if caught early, responds well to treatment. Treatment options for thyroid cancer include radioactive iodine therapy, thyroid hormone therapy, external beam radiation or chemotherapy. However, the main treatment for thyroid cancer is surgery and the conventional procedure is an open thyroidectomy. Surgery for thyroid cancer can involve a thyroidectomy – the complete removal of the thyroid gland, or a thyroid lobectomy – removal of only part of the gland depending on the size and location of the cancer. For cancerous lesions that are smaller than 1 cm and which show no signs of spreading, the surgeon may remove only the affected part of the thyroid gland. If the cancer is widespread, the entire gland may be removed. When the cancer has spread outside the thyroid, the lymph nodes in the neck may also be removed. Surgeons at the National Cancer Centre Singapore (NCCS), a member of the SingHealth group, are now offering a surgical procedure that minimises the visible scarring normally associated with traditional surgery for thyroid cancer. This procedure uses the advanced da Vinci system, a robot-assisted system that enables the surgeon to operate with greater dexterity and precision. What is the da Vinci system and how does it work? 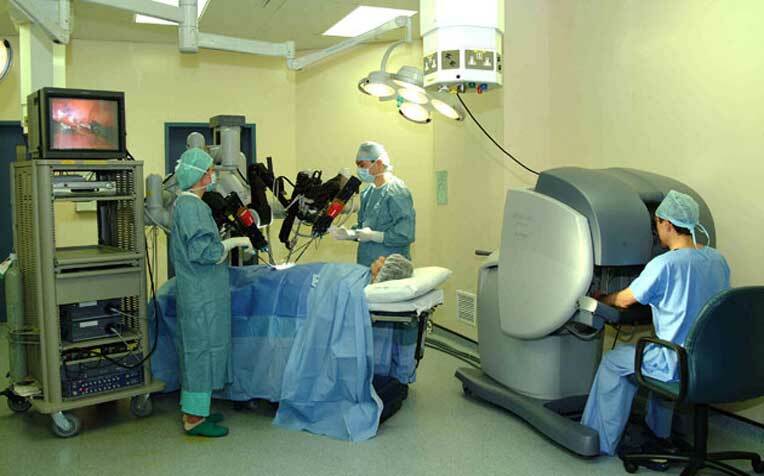 With the da Vinci, a robotic system equipped with a variety of instruments, the surgeon can perform microsurgical movements in confined spaces that are not possible in conventional surgery. The advanced optics of the da Vinci system also allow the surgeon to view the operative field at higher magnification, while maintaining a three-dimensional perspective. In traditional open surgery for thyroid cancer, the surgeon makes a 5 – 8cm or larger incision in the neck which can leave a visible scar. In da Vinci surgery, the incisions are tiny and made in less visible areas of the body such as the armpit. If the thyroid carcinoma has spread to the lymph nodes in the neck, a cervical lymph node dissection can be performed with a scar behind the ear which will be well hidden. “It’s the ideal surgical procedure for thyroid cancer patients who are concerned about scarring,” says Dr Tan. ​Minimallly Invasive Spine Surgery – What Is It?